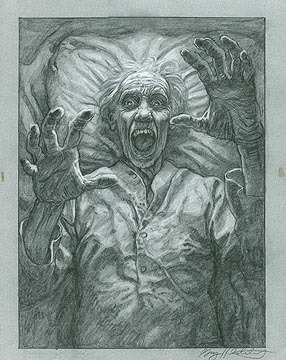 From Greg Hildebrandt's illustrated book featuring Edgar Allan Poe's short story, "The Facts in the Case of M. Valdemar," published by Unicorn Publishing in 1986. Created by Greg Hildebrandt for his Edgar Allan Poe book titled, "Poe." For those who do not know this short story, it is infamous for creating a stir in the scientific community at its time of publication in 1845. Poe wrote such a convincing story that when it was published, people did not know if it was truth or fiction. Poe eventually admitted that the story was fiction, but it certainly held its reputation. Graphite and white pencil on gray paper.